The assessment of external costs of transport in Slovenia for 2002 varies between 6 and 9.8 % of GDP, which is at the level of the EU-15 average (7 %). The majority (over 90 %) of all external costs of transport in Slovenia are caused by road transport. The external costs of transport (the term marginal society costs is also in use) are those negative transport influences that affect society, but are not directly borne by the transport user who has caused them. The most important categories of these costs are traffic accidents and local and global air pollution. Noise and congestion can also play an important role in special circumstances; for instance, urban traffic. Contrary to external costs, the internal costs are those borne directly by the individual user of transport services (for example, vehicle purchase and maintenance costs, fuels, taxes, charges, time spent, etc.). The total social costs of transport are the sum of the internal and external costs (EEA, 2002). In the continuation, external costs of transport are expressed in billions of EUR and in GDP share due to comparability with other countries. The indicator indicates the share of external costs in the national GDP in 2002, volume of external costs of transport by transport modes in 2002 and estimation for 2010. Figure PR05-1: The share of individual external costs in the national GDP in 2002. The calculation for two versions with regard to the lower (min) or higher (max) estimation of impacts of climate change. 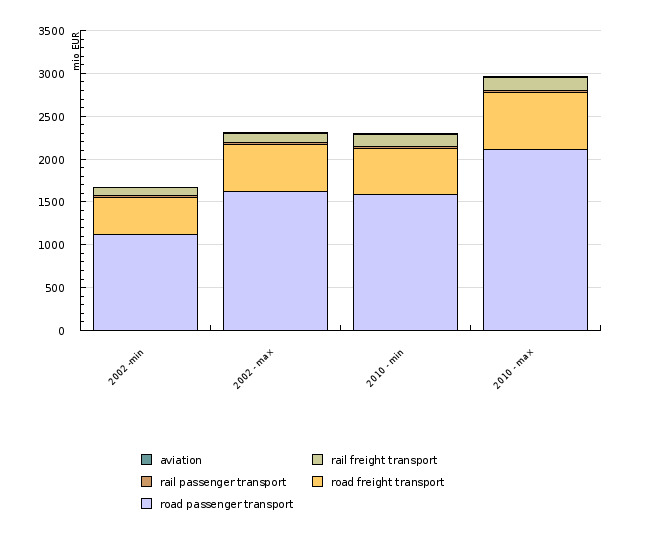 Figure PR05-2: The volume of external costs of transport by transport modes in 2002 and the estimation for 2010. The calculation for two versions with regard to the lower (min) or higher (max) estimation of impacts of climate change. - Efficient energy consumption and a clean environment (Operational Programme of Environmental and Transport Infrastructure Development for the Period 2007–2013). In Slovenia, the first comprehensive assessment of the external costs of transport was obtained in 2004 with a research Analysis of External Costs of Transport (Lep et al., 2004). The total value of these costs in 2002 was according to the more expensive scenario (climate change was considered by the higher estimation) estimated to 2.3 billion EUR, from which road transport contributes 94 %. The sum of costs of the impact of the basis sources of external costs of transport (accidents, noise, emissions and congestion) was estimated to be between 1.4 and 1.9 billion EUR annually. The calculation into the share of the Slovenian GDP indicated that according to the more expensive scenarios the external costs of transport in Slovenia in 2002 amounted to 9.8 % of GDP, which is exceeding the EU-15 average (7 % of GDP). The calculation that considered the cheaper scenario (climate change was considered by the lower estimation) amounted to 7.1 %; considering only the basic four groups of external costs of transport, it amounted to 6 % of GDP. A comparison with the shares in the EU-15 indicated a lower level of external costs in Slovenia due to congestion and noise, while the share of emissions was significantly higher (Lep et al., 2004). The chapter on the economic policy of environmental protection in the Resolution on the National Environmental Action Plan stipulates that business entities and households should take over the costs for the damage caused to the environment, since otherwise these costs shall accumulate in the form of degradation and will present a burden for future generations, while the consequences of environmental pollution will not be correctly considered in strategic social decisions. The starting points of the Resolution on Transport Policy of the Republic of Slovenia stand for one of the possible forms of financial measures regarding external costs; namely, the policy of charging a fee for the use of transport infrastructure by considering external costs, caused by the implementation of transport activities. Such a policy should ensure a more coherent burden on the infrastructure of individual subsystems and a more coherent development of transport activities in Slovenia. The resolution emphasizes the meaningfulness of the dynamic determination of costs and consequently of the price for the use of infrastructure with regard to the conditions and occupancy of the entire transport infrastructure. The payment of all costs for the use of infrastructure would cause a temporal redistribution of traffic flows, which would result in a better utilisation of the road infrastructure and a reduction in congestion. However, the Resolution on Transport Policy did not convert the indicated starting points into specific and quantified objectives or support them with transport polices for the elimination of this problem. Furthermore, it focused only on one area of the wider spectrum of possible measures. 2. Pricing mechanisms (for example, taxes, charges, subsidies) that are directed towards users' behaviour change in favour of the use of sustainable transport modes. Source database or source: Lep, M., et al., 2004. Analysis of external costs of transport. Final project report. Target research programme Competitiveness of Slovenia 2001–2006. Maribor, Faculty of Civil Engineering, University of Maribor; Ljubljana, Institute for Economic Research; Koper, Primorska Institute of Natural Sciences and Technology. Methodology and frequency of data collection for the indicator: External costs are difficult to estimate and there is currently no unique, commonly accepted methodology for estimating external costs. The only calculation of external costs in Slovenia was carried out in 2004 in the project Analysis of external costs of transport within the framework of a target research programme Competitiveness of Slovenia 2001–2006. The project was carried out by the Faculty of Civil Engineering, University of Maribor, Ljubljana Institute for Economic Research, and Primorska Institute of Natural Sciences and Technology in Koper. The estimates are based on the methodology, derived from Infras/IWW, which is, according to the Slovenian authors, general enough, simple and transferable to the Slovenian territory. At the same time, it is used in Europe in order to provide a comparable calculation. Data processing methodology: The total external costs of transport in Slovenia for 2002 are calculated and indicated in €. 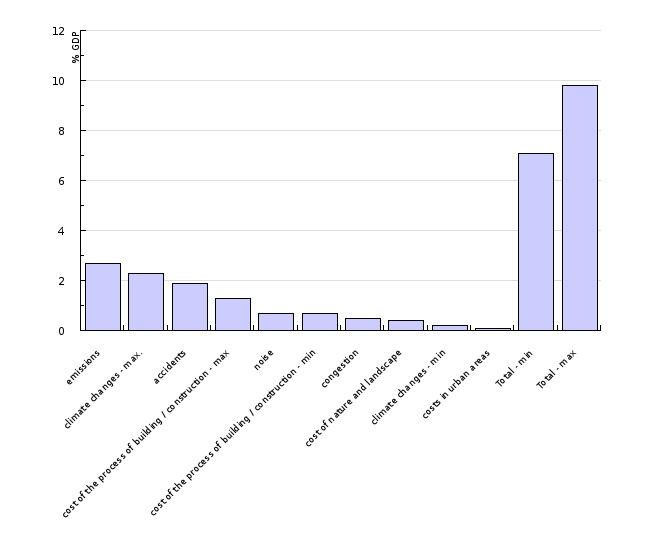 A wide spectrum of estimates of damage or impact to the environment appears in literature with regard to the global impact of greenhouse gases; therefore, two threshold values, different in nature, were indicated in calculations and tables of the results – according to the lower estimation (min), climate change was estimated to 14 €/tonne of CO2, and according to the higher estimation (max) 135 €/tonne of CO2. Mid values or most probable values were used for other causes of external costs. The study prepared also a forecast for the external costs of transport for 2010. A combination of all available forecasting methods – trend, model and target - was used in the study. The volume of transport work, travel habits and some other parameters has been derived from the model TREMOVE. The target method, considering the target values from strategic documents, was used for the forecast of the number of victims of traffic accidents and GDP. - Advantages and disadvantages (at data level): The assessments of the external costs of transport provided an insight into this complex field. However, we are dealing with a study carried out under one of the possible methods; therefore, the reliability of the data is limited. - Relevancy, accuracy, robustness, uncertainty: The external costs are difficult to estimate and there is currently no unique, commonly accepted methodology for estimating external costs. Only one assessment of external costs was carried out in Slovenia; therefore, there is still not any comparative data and methodology. A wide spectrum of estimates of damage or impact to the environment appears in literature with regard to the global impact of greenhouse gases; therefore, two threshold values, different in nature, were indicated in calculations and tables of the results. Reliability of the indicator (archive data): The data refers only to the year 2002. Uncertainty of the indicator (scenarios/projections): The study contains forecasts of the external costs of transport for 2010. - EEA, 2002. TERM 2002 25 – External costs of transport. Indicator Fact Sheet. European Environment Agency (22 March 2006).